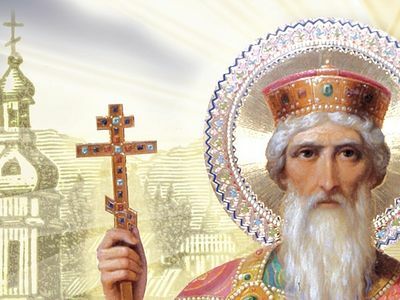 The Orthodox world gathered this week in celebration of the 1,030th anniversary of the Baptism of Rus’, celebrated on July 28, the day that the Church commemorates the holy Equal-to-the-Apostles Grand Prince Vladimir, who adopted the Orthodox faith for the people of Rus’ in 988. Festive Liturgies, molebens, and cross processions were held throughout Russia, Ukraine, Belarus, and beyond, with the main celebrations being held in Kiev and Moscow. 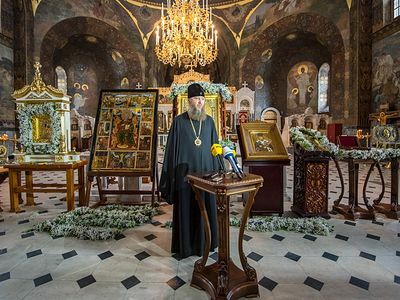 Delegations from twelve Local Orthodox Churches from throughout the world gathered in Kiev to celebrate the great event with the Ukrainian Orthodox Church under the spiritual care of His Beatitude Metropolitan Onuphry of Kiev and All Ukraine. A massive cross procession was held on Friday, in which 250,000 faithful participated, with the All-Night Vigil on Friday and Divine Liturgy on Saturday being celebrated on the square in front of the Dormition Cathedral of the Kiev Caves Lavra. In Moscow, the anniversary was celebrated with the first-ever open-air Divine Liturgy inside the Kremlin, celebrated on the cathedral square, followed by a cross procession to the nearby monument to St. Vladimir on Borovitskaya Square. Delegations from ten Local Orthodox Churches gathered in Moscow, with His Beatitude Patriarch Theodoros II of Alexandria and All Africa leading the Liturgy with His Holiness Patriarch Kirill of Moscow and All Russia. 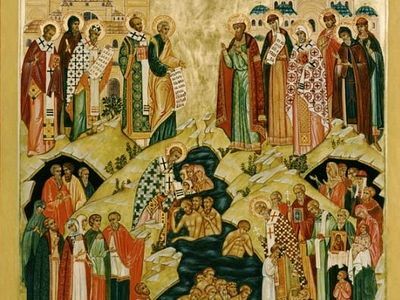 Why do we refer to the Baptism of Rus’ as a turning point for the history of our peoples? Because it forever changed the face of the of the entirety of Slavic civilization and predetermined the subsequent path of its development.